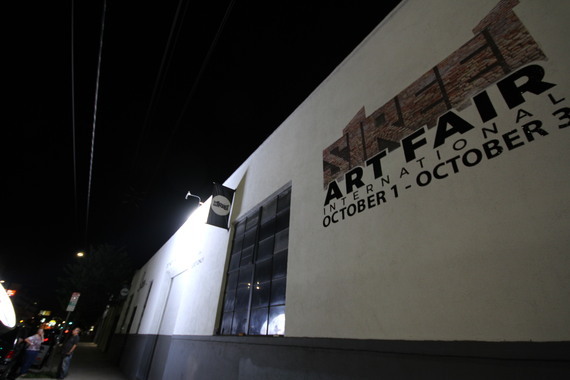 The first-ever Street Art Fair LA is going down this week at Siren Studios on Orange and Santa Monica in Hollywood, probably the biggest collection of street art in Los Angeles since MoCA's acclaimed "Art in the Streets" exhibit in 2011. Over 100 artists from LA and as far as London have taken over sound stages with huge art installations, sculptures, new works, books, stickers, clothing, prints, and more. 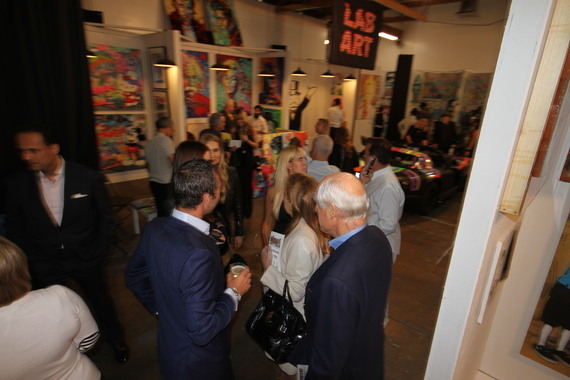 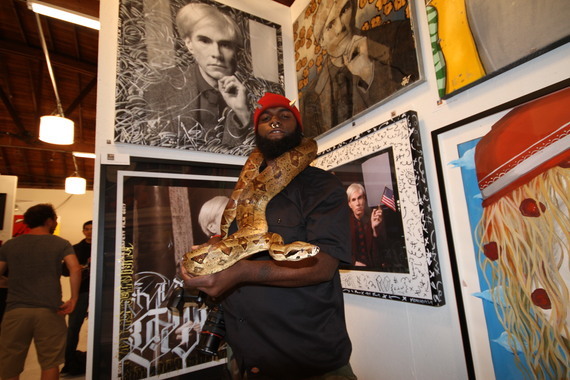 After a packed opening party Thursday night, the show ends Saturday at 4 p.m. 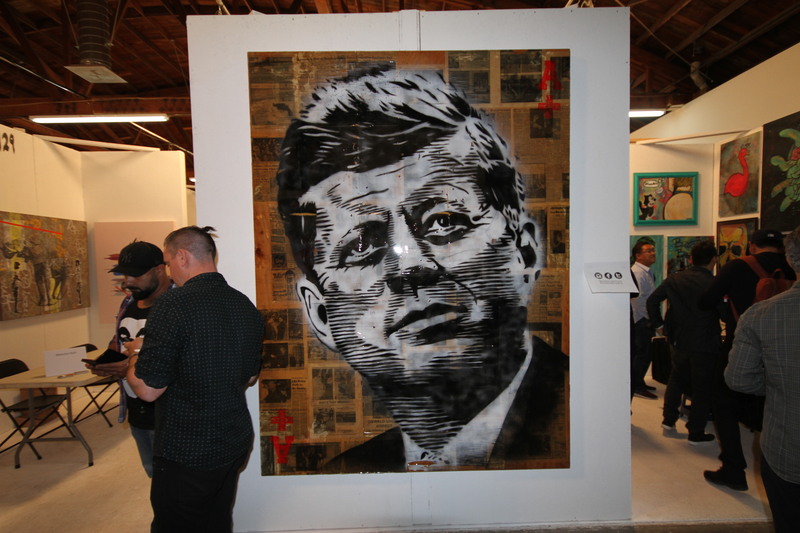 The show, entitled "Street," allows art fans to meet their favorite street artists, something that can be pretty hard to do considering most artists work with aliases to avoid arrest. 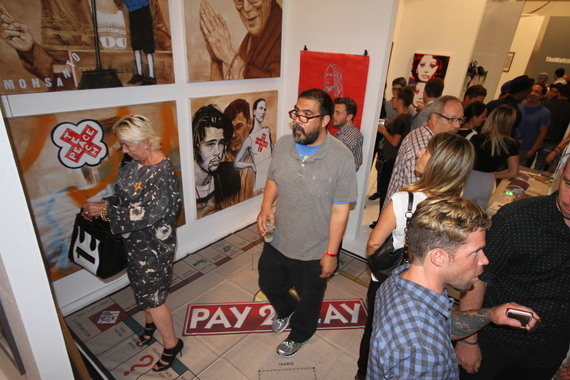 With street art, the artists' names might not even be on it, so touring the exhibits can be informative to connect the style and logos with the artist. 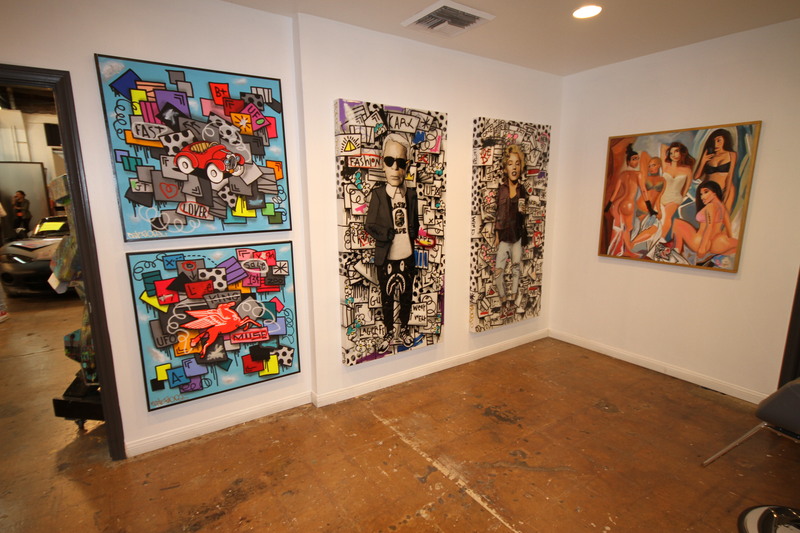 "We believed that the street art community lacked a vehicle to directly reach the fans and many followers clamoring for a more personal relations and interaction," explained Christopher Andreoli, who is putting on the show with Jeff Hamilton and Iskander Lemseffer. 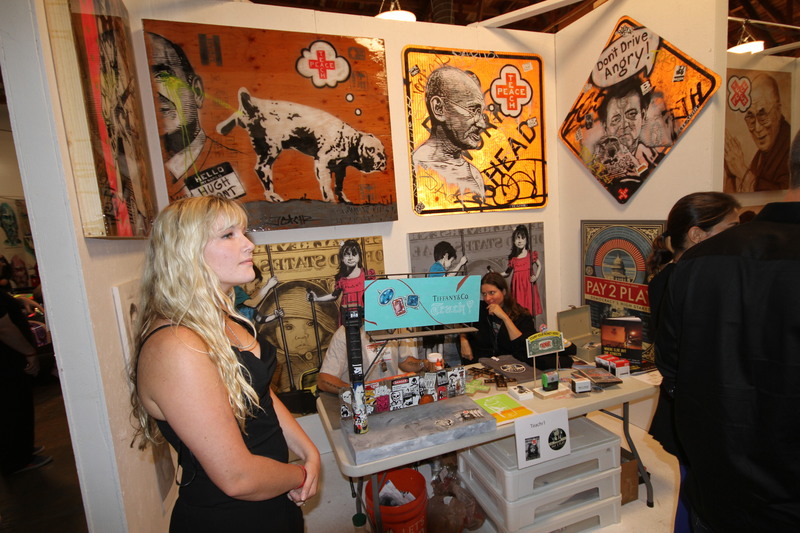 "The energy and excitement at our first Street Art Fair confirmed that belief." 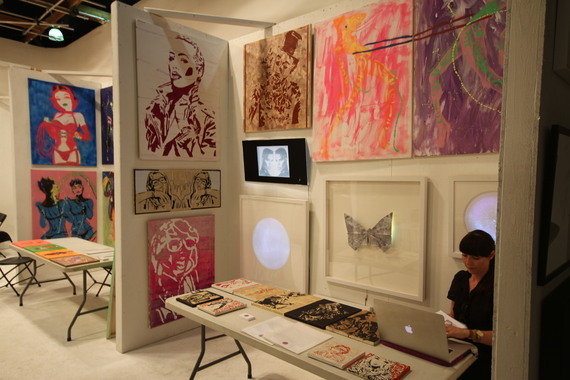 Gallery owners have booked stalls and small artists have staked out the visual landscape of STREET hoping to stand out and interest art buyers. Some art collectors know to buy a number of pieces at an event like this, because just one artist becoming valuable can be worth the ten paintings bought from up-and-coming artists. 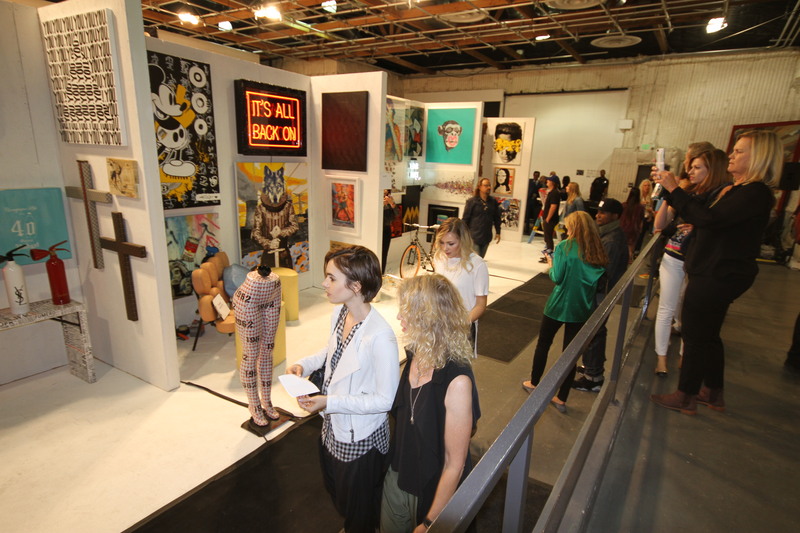 But it's clearly not just art collectors showing up, as the first day an estimated 1500 people came through the show, many of them younger street art fans just excited to get a free sticker from a cool artist. On Friday, there was a live stencil demonstration by Teachr, known for his portrait stencils on traffic boxes all over Hollywood. 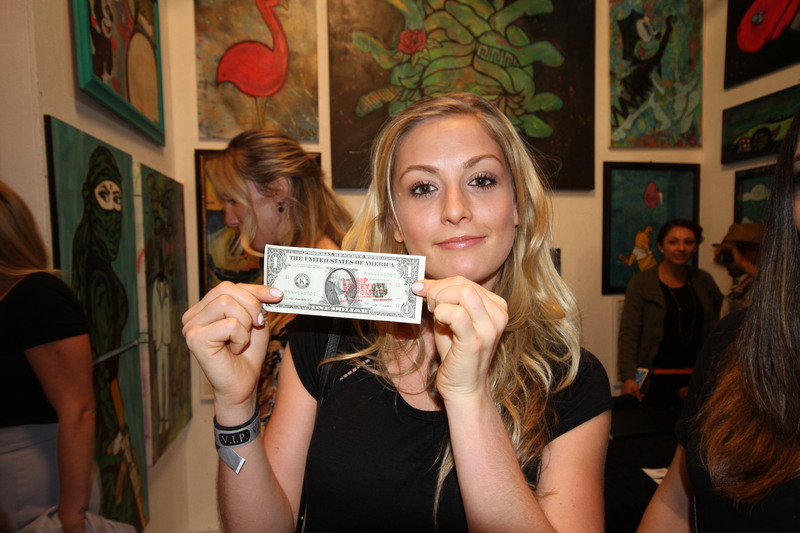 "For the first street art fair it was great. More like an exhibit. 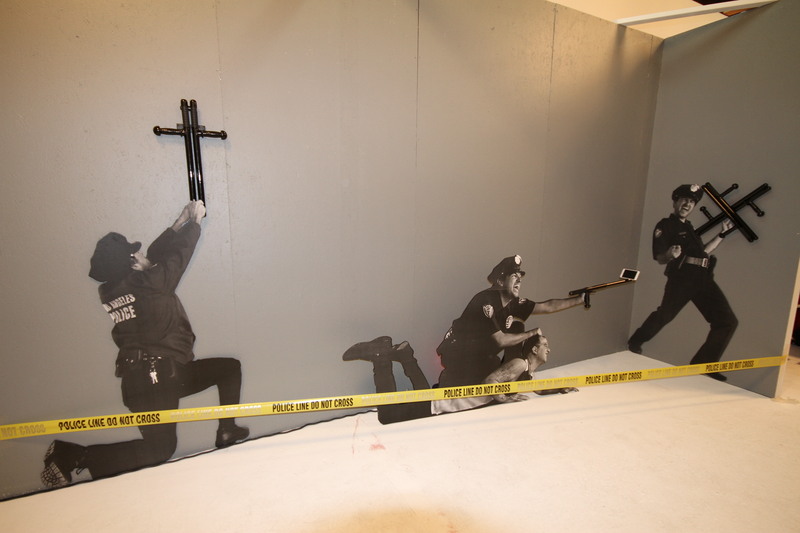 I met a lot of people who said they came to meet me and learn how I make my stencils," Teachr said. 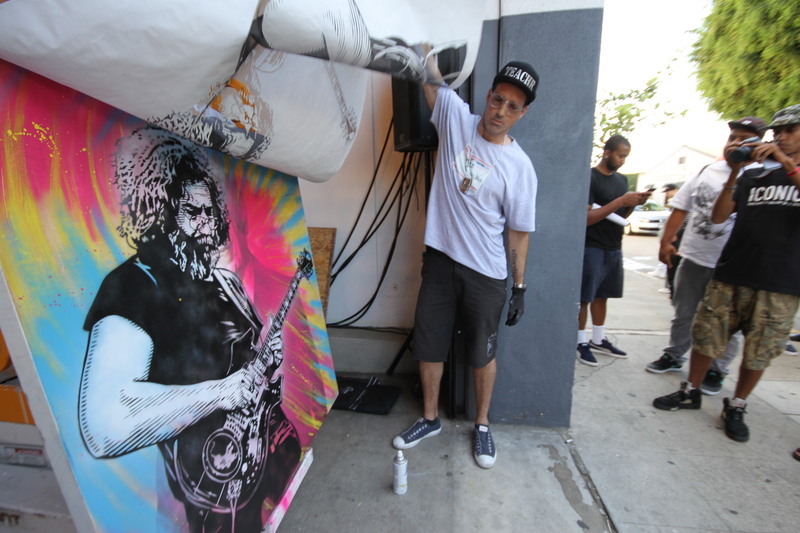 A small crowd watched as Teachr explained his process while spray painting Jerry Garcia with a tie-dyed background over a portrait of Rupert Murdoch. The piece was entitled "Creative Over Corporate," and is now for sale at the fair. 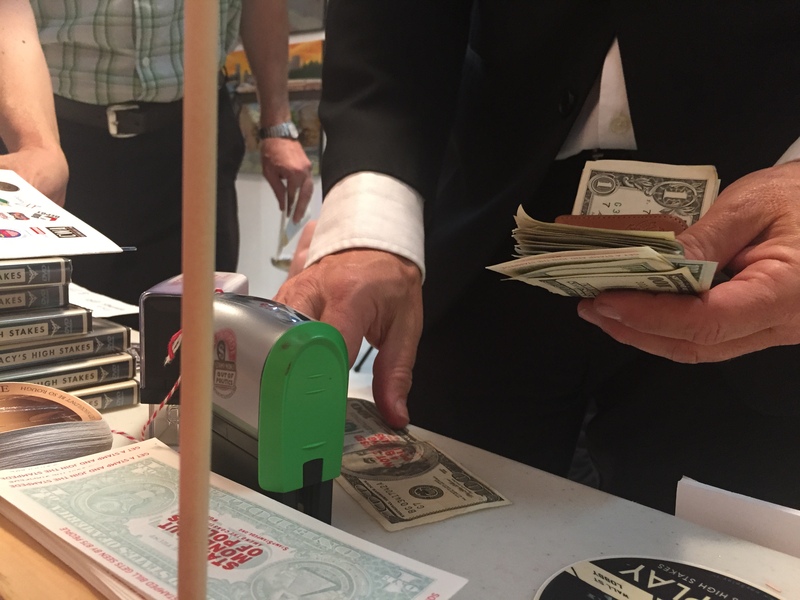 Another popular interactive feature was the Stamp Stampede station, where attendees could vandalize currency with an anti-corruption message. 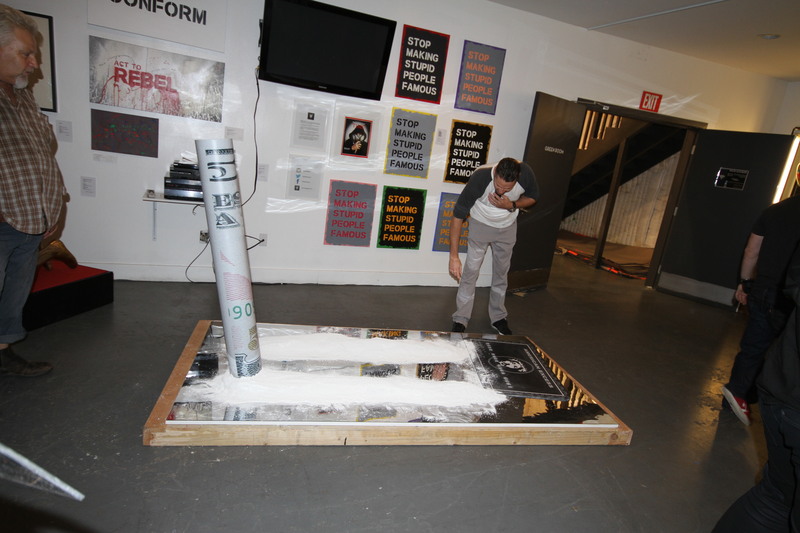 With each bill being seen on average by 875 people, this act of raising awareness through a message emblazoned across public surfaces has something in common with street art, and proved to be an opportunity to stamp more hundred dollar bills than usual. Artists featured include Alec Monopoly, Dytch 66, Risk, Odlaw, Greg Auerbach, Clinton Bopp, Annie Preece, MONCHO 192, Teachr, Plastic Jesus, Mr. Brainwash, BournRich, Fishe, Flore, Big Sleeps, Cartwheel Art, Carlos Marques, Fraser Crowlet, Knowledge Bennett, John Westbay, Scott Marsi, Phobik, Planet Winter/Christian, Rolland Berry, Teachr1, PAY 2 PLAY, Desire Obtain Cherish, Wicky, Clinton Bopp, EL CASH, Jay V, Jim Daichendt, Keter, Jeff Hamilton, Vizcons, AngelOnce, Mar, Jon Lee, BLEEPBOOP, Blikeme, Corrado Cristiano, Justin Pierce, Ken Matthews, Klaire Russel, Lori Rubin, Man Man 1, OOGUM VISIÓN, Phenomenal Mark, Ric Diculous, Ryan Hester, Tricia DiMarco, Gary John, Pascal Guetta, The Producer BDB, Nelson Delanuez, Zibi, Cornbread, Madman, Jackie Dutch, Todd Pierce, Narrator, Starvolt, Jafleu, Max Henry Fraser, Johnny Brushstrokes, Seishimura, Karen Bystedt, Alexandre Dallouard, Benjamin Alejandro, Carl Paoli, Drone, Kaleo, Dotmasters, Mattia Biagi, Morley, Ostrich, Cube Works, Brent Estabrook, Bryden Lando, Daniel Cohen, Domingo Zapata, Gillean Clark, Halo, Jason Alpeer, Kaï, Matty Fontana, Mister e, Stu.Art, Trust.icon, XVALA, Yann Houri, Niclas Castello, Stone Malone, Lamar Supreme, Grey Greviera, Sean From Texas, Tina Lugo, David Cook, Ryan Macintosh, Leba, Gianni Arone, WRDSMTH, Brains n Noodles, Lucas Raynaud, Darci Yates, The Gossip In The Choir, Diana Georgie, Risk, Kelly, Dilated Peoples, Nathan Ota, Tyke Witnes, Sever, and Ewok. 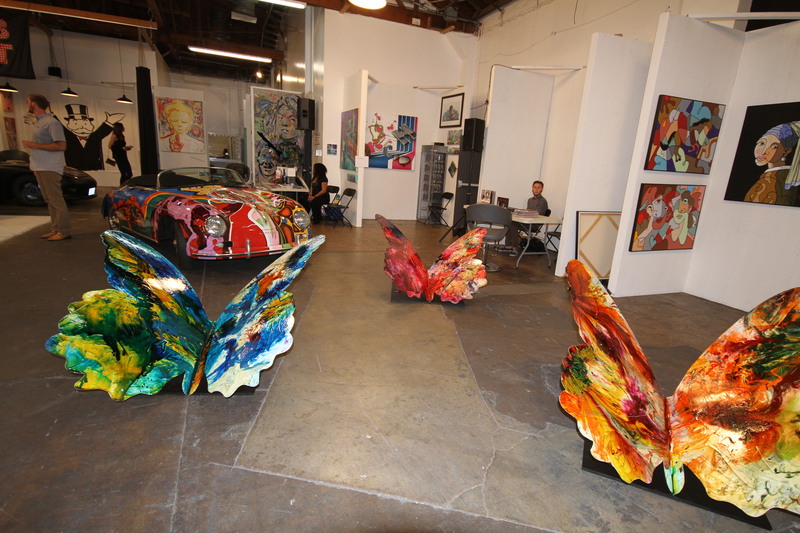 Galleries participating in STREET include Lab Art, Alchemy Gallery, Bruce Lurie Gallery, Gallery 38, The Artist's Corner, Go Gallery, Stone Malone, Silver Odyssey (UK). John Wellington Ennis' book on L.A. street art, Where Else But the Streets, will be released this month by Rothco Press.